Christmas 1916: Prisioners arriving at Westland Row Train Station, welcomed back from English prisions and from Frongoch Camp. Liam ó Briain was among them. One of the real benefits of the the centenary commemorations of 1916, is the amount of research and new material that has been published on the background to the Rising, and in particular on the personalities of the men and women involved. I remember the 1966 commemorations. The men of 1916 (women were barely mentioned ) were presented as supernatural heroes, all practically saints and scholars. Now we know that among them were the same characteristics that you find in most of us today. There was a fair share of loving, family men and women, warm student friends, who laughed and joked, who were vulnerable and emotional people; yet all totally committed to their dream of a free Ireland. Among their ranks, however, were the normal mix of drunkards, narcissistic personalities, and those who lacked any kind of empathy. Dubliner Liam Ó Briain, had just returned from three years study in Germany in 1914. He was a brilliant student of romance languages at UCD. So much so that he was awarded the first travelling scholarship by the National University of Ireland: three years studying in Berlin, Bonn and Freiburg. As he was leaving Germany he saw ‘soldiers and policemen everywhere, all of them heading in the direction of France and Belgium, huge guns on every bridge, the terrible military might of the Prussian Army springing into battle’. When he arrived in Dublin he was amazed to find the streets ‘swamped in Union Jacks’ - and yet in direct contrast to the recruitment posters and rallies with bands and loud voices, he saw ‘young men nonchalantly walking the streets without a care in the world, carrying guns on the shoulder or under the arm’. This was his first sight of the Irish Volunteers. He knew many of them from the Gaelic League classes or attending Arthur Griffith’s lectures before he went away. After a brief debate with himself as to whether he would side with the ‘older generation’ led by Irish parliamentary leader John Redmond who urged young Irishmen to join the British army and fight for Home Rule; or follow the younger voices of his friends, and join the Irish Volunteer movement. In the end O’Briain felt that he had no choice. As a boy he was passionate about the Irish language, even though there was no Irish spoken in his home. He had taught himself Irish from an old grammar book, and was so preoccupied by its words and meanings that his other school work suffered. Recognising that he was an exceptional student his teachers and parents insisted he put aside Irish and concentrate on other subjects. 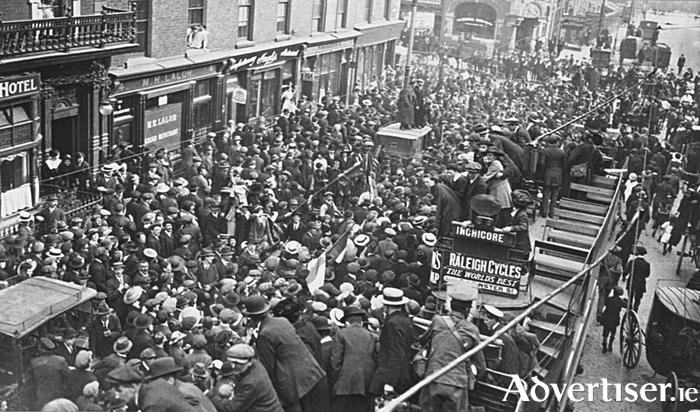 Now at the age of 26 years he was back in Dublin caught up in the excitement of its preparations for war. But his friends convinced him that there would soon be a war of a different kind. Excited by Gaelic nationalism, he was swept into the Volunteers. A fortnight before Easter Week, he met his friend Seán Mac Diarmada, a popular political activist and one of the seven leaders who planned the Rising. MacDiarmada told him he was exhausted from the feverish preparations now taking place. ‘I have a dizziness in my head. I can’t sleep’. Liam Ó Briain was professor of Romance languages at UCG from 1918 until his retirement in 1959. He was a very well liked man, with a great sense of humour, but above all, a passion for the Irish language. His involvement in the struggle for Ireland’s independence cost him three periods in prison. After the Rising he was sent to Wandsworth, and then to Frongoch camp north Wales. He was released at Christmas. Later Ó Briain became an admirer of Michael Collins. During the War of Independence he was arrested and imprisoned in Belfast for raising money to buy arms. Later Collins sent him to France and Italy to arrange arms shipments, but he was dramatically arrested in the UCG dining room by the Black and Tans. He was again imprisoned, this time for 13 months, first in Galway gaol and then the Curragh camp. In Cuimhní Cinn (first published in 1951 ), he wrote his memories only covering his involvement in Easter Week It has been recently translated by Eoin Ó Dochartaigh, and reissued as Insurrection Memories 1916 - Liam Ó Briain (now on sale €15 ). His language is far from the solemn accounts that we have come to expect in memoirs of that period. He wrote instead in a relaxed, self-deprecating, style. During the Rising, and in its general confusion, Ó Briain ended up serving under Michael Mallon of the Citizen’s Army in St Stephen’s Green and at the College of Surgeons. There was fighting; but one of their biggest worries was lack of food. Hunger drove them to knock holes through the adjoining houses, and search for sustenance. Apprising the scene, Ó Briain put away his revolver. The man, who was a former High Court judge, demanded by what right they had to burst into his living room like this. Ó Briain asked him if he thought they were common criminals? The judge shrugged and said he did not know who they were. They left the judge and his women alone, and went on through the houses. Later Ó Briain was amused to read that their visit to the judge’s home was sensationally reported, that ‘Sinn Féiners’ had seized a poor elderly judge, brought him down to the cellar in his own house, and left him with his hands tied with a rope. Next week: Countess Markievicz asks for a nightdress.